You are invited to ask questions or give a comment at the end of FAQ-list. Where can I get RCCDroid/Pro ? What is the difference between RCCDroid and RCCDroidPro ? RCCDroid is a free App, for making pictures remote (e.g. BULB) without touching the camera. RCCDroid may help you to check, if your equipment is compatible with the App. Further features, like Timelaps or Star Trail are provided with the Pro-Version. Please always start with the free RCCDroid-App, to be sure, that you like to continue with RCCDroidPro. What devices are supported by RCCDroid/Pro? - It is important, that your Android powered devices are supporting the so called USB Host Mode (including hardware AND software). Please check the prerequisites with the free Google Play App: 'USB Host Diagnostics'. then your device meets the requirements. Why does RCCDroidPro needs so much Android permissions ? RCCDroid Pro has much more features than RCCDroid. The use of special hardware features (e.g. Bluetooth, GPS oder Microphone) needs the required permission. Why do I have to adapt the default folder for the pictures ? We recommend to adapt the path at the first start of RCCDroid/Pro, because without a valid destination it will not be possible to make pictures. The App tries to use a default path of Android system (usually the 'Pictures'-folder). If the path is not available (on the Android device), or is not writable there will be no connection to the camera and the shutter will be locked. Why is a connection to camera not possible ? and attach the screenshot of USB Host Diagnostics plus the RCCDroid screensshot. Why is Shot and Bulb locked in free version of RCCDroid ? Free RCCDroid is not able to handle continous shooting in Drive Mode of camera. There will be an error sign in the Drive M. field of App. Please switch camera drive mode to single shooting. The App crashed, what can I do ? We always try to deliver clean software. Nevertheless it might happen, due to programming mistakes or system problems, that the App crashes. Please help us to improve the RCCDroid software. After a crash, there will be an option to leave a short comment. Please give us a hint what has happened there. Maybe you are able to find a situation, where an error always happens. Please write an email to us in this case and try to describe the procedure to repeat the error. Thank you in advance ! Why are the taken pictures stored on the Android Device ? This is not a problem of the app, but a part of the Sony firmware. Even the Sony Software for Windows does the same. We are so sorry, but we cannot overcome this behaviour. There is a little workaround, if you like to have the pictures on your camera. Please stop RCCDroid at the end of the shooting. Put your camera via menu in 'Mass Storage' Mode. Use any Android filemanager to copy the pictures from your Android device back to camera. Why do filenames have a prefix ? The names of the pictures are given by the camera software. Under specific circumstances it may come to duplicate filenames. This must be prevented, because pictures may be overwritten. Therefore RCCDroid is using a prefix for the Sony picturenames. If you do not like this, it is an option to switch of prefexis in the settings. This may be useful if you like to use some other software e.g for timelaps. However we do not recommend this to prevent loss of data ! Why are some settings deactivated (grayed) ? If your Android device does not have the necessary hardware for some options (e.g. Bluetooth, GPS, ..), you will not be able to activate them in the settings. Does RCCDroid support A57, A77, A65, A55, NEX .... ? Please do NOT ask for support for other models. Does RCCDroid provide a liveview function ? Liveview für A7S, A7II and A77II is possible now ! Sony firmware for other models is not able to send liveview data to tethering software. Can I store pictures on external SD-card of my Android device ? Sure, please change default folder via settings. You can climb up in the filesystem tree by touching '..'. Please change to filesystem /mnt. There you should find the external SD-cards (the names depend on your device and Android version). Since Android 4.4. (Kitkat) it is not allowed for Third-Party Apps (like RCCDroid) to store data in every directory on external SD-Karte. Afterthat please make this directory to Default Folder in settings and reboot your Android device. ATTENTION: This directory will be deleted after deinstallation of App !!! Take care to save your pictures BEFORE deinstallation. Is there a Manual ? Is RCCDroid Open Source ? What features are planned for future versions ? Please send a comment or email to us, if you would like to have other options. Will there be an app for iOS? So live view and the ability to start recording for Sony A6000 is not possible huh? A6000 does not send live view data over USB, so we are not able to display it in our app. Start of video recording is possible without any problems. No, sorry. This app will not released for iOS. The developing was a time consuming tasks and we do not have any experience with Apple products. Every Computer-dealer will help. We prefer Amazon as an option to order items online. Does it work with A7R or just on A7? we did not have the chance to test it with A7R or A7S, but we are sure it will work, because there are no differences in the interface. To be sure, please check with free version of RCCDroid. If it is ik, there will be no problems with RCCDroidPro. The Sony A99 has 2 slots for SD. I use one for jpeg and the other for RAW. Will both be sent to the android device? Would be great to send just the jpeg to the device en leave the RAW on de SD-card. Pls. check FAQs. It is not possible to leave pictures on SD card in USB tethering mode. Why this program not create folder for pictures automatically? Or find system folder for pictures? "Only FAQ help me to understand why program not connect to phone"
This is NOT correct. There is an error message window, when app is started plus additional a warning sign in the line of the filed plus FAQ Hint. "Why this program not create folder for pictures automatically? Or find system folder for pictures? " A lot of Android devices do not have to change anything, because implementation of their Android is correct and Defaults have not been changed. I tried free RCCDroid with my A6000. At first It said not compatible. However it did connect and the shutter and focus on RCCDRoid did work!. Does this mean that the Pro version will work with the A6000 ?? Very good question ! The message 'Model not supported yet' is more a warning. The App will continue to work, but we never had the option to do tests with the mentioned model. So please continue to work with RCCDroid and A6000. Please contact us via email. Great app!! Is possible for the future the focus stacking function? We woul love to realize it, but unfortunately Sony USB protocol does not provide command to adapt focus automatically. If you have another approach, please write email to us. Greetings, If I use this app with my A7 and shoot in RAW mode will the raw files be saved to the camera or will only JPEGs be saved, and only to the phone? All files (RAW and JPG) will be saved to Android device. No files will be saved on camera. Pls. check FAQ. just to confirm that the Pro version works with the Sony A6000 - although it says unsupported. Thank you. Yes, RCCDroid works with A5000 and A6000. There is only a warning message. We will remove it in next update. when will be support on the ILCE -5100?? we did not have the chance to test, but we are sure it works with current version. There will be a warning message at start, but you can continue without problems. Please give feedback to us. we got the confirmation, that app works with a5100. There is only a warning message, which will be removed soon. Hi, I'm using the Pro version with Galaxy S4 and Sony A7. It connects OK and fires the shutter - the text in the status area says File written file:///storage/... but a message pops up "FileNotFoundException during store file". I've tried creating a new folder on my SD card and I've tried using the existing Camera folder. Afterthat please make this directory to Default Folder in settings. Thanks so much for replying - now that I understand that limitation, it is working for me. Thank you! Please confirm which "Photo editor" program you reccomend for viewing photos taken. Is it the " Dev.mcgyver" one? Yes, we like to use Photo editor from dev.macgyver, but there are some other apps like 'Fast Image viewer' or Rawdroid (for preview of RAW), that are worth a try. I am confused, the home page says that it is compatible with A77 II but the page with FAQ says that it is not. So, what is it? A77II is supported, but old A77 not. There are some RCCDroid internal modes (e.g. extended HDR), that need the single shooting mode, a hint will be showed in that case. Hi, this looks really interesting, is there a Windows Phone release or do you not plan to release one? No, sorry, there is no Windows app and we do not plan to implement it. Perfect application. Just a pity that it is not compatible with Huawei mobile phones. It would have to work on that, please? Thank you. IT IS compatible with all phones, that meets the requirements (USB Host mode). We use a Huawei P6 without any problems. How does the phototrap work? Please read the manual. You can find a link in the FAQ or you can click on the icon in the upper right corner of the main site. Not yet, but we are working on this. There is already a youtube video showing this (please search for rccdroidpro). Unfortunately the software on mr3040 cannot be used, because of the difference to the sony protocol. So we have to make an update for the the router firmware and the RCCDroid app, but it is our plan to finish this in the next 3 months. Is it possible to do video cropping a central area cmos chip with the A6000?, Better known as ROI (region of interest), very useful to reduce the size of the files, when not necessary to use all covered by the chip area. For example in astronomy when videos of planets do, do not cover but a small central part of the image, the rest no information. It would be possible, if Sony would send the liveview data in full resolution via USB. Unfortunately it is not sent for A6000 and send in low resolution for A77II and A7s. Hi! I have Lg e975 optimus g. And I see a message "Your device is not supported". Is that true? What can I do to get Rccdroid? is it possible to realize the control of two synchronized cameras? Now, works well with my new Archos Helium 55 plus (Android 5.1 Lollipop) and an SLT58. As I always shoot JPG+RAW, each time I take a pic with RCCDroid, it shows the JPG then switches to an error message that could be translated to "media file not found". I think your app tries to display every file it receives but ARW files cannot be shown on the Android system. May be you could add an option in order to display (or not) only JPEG ones ? Preview of taken pictures is not done by RCCDroid itself, but via calling of other apps, that are able to display the picture format. There are a lot of apps in Google Play Store to show Sony RAW Files (e.g. RAW decoder). Please check our Manual linked on this site to get more information. Hi! I have to take high speed focused photos using the Sony a6000 camera. I can build an Arduino laser sensor with a Bluetooth 4.0 module. How can I configure your app to automatically trigger a photo using a Bluetooth laser sensor and then save the taken photo in my Android device? That is an interesting project, that we would like to support ! Please contact us by email. Mine is Alpha 77 m2 how to use liveview..? Is live view possible with my A 77 M2 , if yes pls say how..? Does this work with the Sony DSC-RX100M3? Also, Sony's PlayMemories Mobile app allows some remote operations of the camera and enables the images to be stored on the camera or transferred to the Android phone. Like many of your users I much prefer to keep images on the camera and not waste time and battery power transferring them to the phone - as Sony can do this does it mean that you could provide the facility to store images on the camera too? All of your question are already answered here. Sony's USB interface is not able to let the pictures stored on cameras sd card. Beside that it has more features of control the camera. Anyone using Xperia Z3? is it compatible? I was under the impression this was an app to achieve a wireless connection between an android device and my A99V. Am I wrong? If it does achieve a wireless connection what plugs into the end of each cable? If the cables are plugged together giving you a separation between camera and android device of 30cm with full camera control why would you want to do this? Why no response to Anonymous at 7:34 AM looking for the same thing? As per Section 6.4 of the manual, you would need 2 android devices with Bluetooth. Setup would be Android device 1 connected via cable to the camera. Android device 1 will need the full OTG USB compliance + RCCDroid pro, and device 2 just needs Bluetooth and a version of rccdroid. Assuming I only really need remote control of shutter and aperture, remote control of autobracketing, and remote live view, what, if any, are the advantages of your app over the Sony remote wifi app? Also, is it possible to save the files in two places, that is, on the hard drive of the attached tablet and on an SD card inserted in the tablet? Would it be possible to add functions for recording and playing back macros? (not macros as in macro photography but macros as automated playback of actions). Also to be really usable one must be able to focus as well (by moving the focus point around), will that ever be an option? Thanks for the wonderfull app. Is it possible to connect the sony slt-a58 via mini usb bluetooth dongle with the help off the OTG cable. So there will be a bluetooth connection with the smartphone? Will this software allow me to see the changes made to the picture on the tablet before the picture is take, ie is it tablet like a large view finder with camera controls. Camera I am using is Sony A77ii. Sure, A77II is sending liveview data over USB, but with a low resolution. Your hardwork for this app is really commendable. Thank you for such a great app. I bought the pro version. I was expecting that the I can change the mode and ISO settings from the app which is not happening. Can you suggest if I'm wrong somewhere. Right now the AF,Bluetooth and shutter button works totally fine and also shows the preview perfectly. All exposure parameters (e.g. ISO) can be changed with the Pro Version. If you have problems, please write email with camera type and screenshot to us. Is a7sII also in the group of cameras that profit with Semi-Lifeview in you app? Can you specify what exactly Semi-Lifeview is? Is it just live view with low framerate? As we started to develop RCCDroid, no Sony Alpha was able to display real liveview via USB. What we called 'Semi-Liveview', was the ability to transfer the taken picture to an Android display. In the meantime some of the Sony cameras have the option to transfer liveview data over USB, so that our app is able to show it on display (real liveview). This function is documented for A7S, A7II, A77II and A6300. We assume, that all newer models will have this option as well, but for now (status April 08. 2016) we do not really know, because we do not own A7SII. You are invited to install RCCDRoidPro and make a test. Please let us (and other interested users) know, if it works. Using my Sony A6300 and Android 7" tablet, Live view is very small and pixelated, and the light metering does not update on the tablet screen - it stays at 0.0 .. Is this normal? will there be updates to make the Live View more full-screen and contain the readouts on the screen of the camera on the tablet as well? It seems very limited at this point but I am happy to support a developer so I'm not complaining. The live view 'window' can be moved and it's size can be adapted by gestures. We do not display liveview in full resolution to prevent an overload of cpu usage, because each picture must be decoded. In next version resolution may be changed, because new multicore processors have enough resources. There is no light metering displayed in app, because this data is not send over USB. Please read our online manual for a detailed description of the values showed on display. I want use this app for timelapses, but at the same time i am concerned about shutter actuations. I know I can enable silent shutter in camera settings. Does this app override the silent shutter setting like Sony's remote API does or it supports silent shooting for a6300. RCCDroid does not override any settings made in camera. USB interface works similar to all manual settings done on camera. Releasing shutter via RCCDRoid does the same, as if you touch shutter on camera. So, if silent shutter is enabled, our app does not change anything. If I read the information correctly RCCDroidPro is an app installed on an android device then that device USB connects to my camera allowing me to adjust all camera settings without a PC or Mac tethered to the camera? Is there a procedure to update to new version if I have already purchased pro V3.0.18? sure, it is the same procedure used for other apps. Please start Google Play Store App, go to your apps and start update (if it is nit done automatically). I'm using RCCdroidPro, Galaxy Tab A, Sony A6000. FYI - When first connected, I sometime have to hit rccdroid/Reset, before the camera will connect. After it does connect, the I can successfully take single images. However, when attempting the Bulb Intervalometer, I have been unable to change the various variables (exposure time, interval, etc) in Settings. I change a number & hit OK, but the number reverts back to the default, Changing Drive M between DrvMode & BulbInterval has no apparent effect. None of the direct entry variables in Setting can be changed. The Delay slider in AutoShots does change, and the Default Folder does change. Thanks to Tech Support's guidance, this problem was quickly solved. RCCdroidPro works well & as designed. As a new user, initially I did not understand Settings variables can be changed by either direct entry or by sliding. Within Settings, when a given variable is selected, a window will popup mid-screen displaying the current variable's value. A numeric keypad will also be displayed at the screen bottom. When a new number is touched (selected), it will display in the variable window, however it will not be recognized by the program until the keypad Done button is touched. Then to execute the change, the OK button in the variable window needs to be touched. Alternatively, variables can be changed by simply sliding the variable displayed number up or down and then touching OK to execute. Thanks for a great program. Any chance you have tested this with A7Rii? I am trying with Note 10.1 2014 and Huawei Mediapad X2 and both passed the USB test but still wont ever connect to the camera. I am happy to pay for it. A7RII should work in the same way, like the other Sony Alpha models. Would you please send us your USB test result (screenshot) by email ? Did you follow the connection procedure described here in our Quickstart section ? I just purchased the app and it works great. I can't figure out how to start video recording though. How do I start video recording? Hi! Does the live view function work for A68? Can somebody confirm? yes, we can confirm, that live view works for A68. We own one ourselves. Hi. I am hoping to use your app to trigger 2 (twinned) sony a6000 cameras simultaneously for 3d still photos. I need synchronization to be accurate enough for action shots. Can I accomplish that with your app? Thank you! We are sorry, it is not possible to do that, with the current version of the app. Does this, or will this, work with the new Sony a99 II? Hello I`m using the free version work perfectly, but I can`t find the raw images. Are there in any place? or the app don`t save it? RAW files will be tranferred to destination folder on Android device, if RAW option is switched on in camera. Hi, this is my 3rd time trying to get it to work before buying the Pro version but I am still stuck at the point, i could not set the default folder to microSD card on my Samsung Galaxy S7 + Sandisk microSD card. - Is there anything else I can try ? Would really wish to get it to work and get the pro version because needed the advance bracketing features and also for timelapse purpose. My internal storage is just too small. Will this work with an A7SII and if so, will the HDMI output still function with this app so that I can use the app to trigger video recording and record on an external recorder? yes, yes, yes (video recording can be started on camera) in Pro Version. Please try our free version, to test the first two questions. I have a Sony SLT-A58 with firmware version 1.0. I have downloaded the app and connected my Huawei P10 via a Type C Micro USB to Micro USB B cable. I can see the camera VIA MTP or Mass storage but cannot use any of the functions of RCCDroid. I contacted Sony and was told that this camera would not work and what is more it would not work with their own software on my laptop. I apparently need an SLT-A56K, Y or M variant. can you provide and further information, or has anyone else got this to work on an SLT-A58??? Sorry, but it seems, that you haven't read any line of the documentation here on the website. 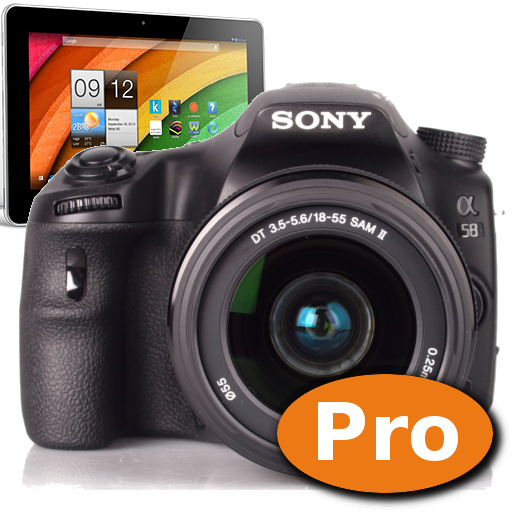 RCCDroid was written for my first Sony camera, an A58. Please check the provided procedures in Quickstart and FAQ tabs. Hi, just an update of my post. I borrowed my wife's samsung and connected to my A58 using a Micro B OTG and A to Micro B cable after I installer RCCDroid on her phone. Everything worked very nicely and I was able shoot and store images on her phone. Feeling more assured I switched back to my Huawei P10 with the Micro Type C to Micro B cable, Hey Presto, everything now works as beforehand it wouldn't. feeling more confident now I connected to my laptop using a type A to Micro B cable and used Sony's own Remote application and guess what? It worked. I had contacted Sony and was told by their customer service the my camera would not work using this application and up to this point this information had seemed correct. While the camera will still not do live view I will be updating to RCCDroidPro as soon as possible. Great App, I will recommend it as ***** (5 Stars). Sony ILCA-A68 sends live view for sure by usb; I can see it with sony's Imaging edge remote app, play memmories, and even 3th party soft like Capture one...this stops to me to buy RccDring for now.. Will you implement live view for ILCA-A68 soon? Live is implemented for all Sony cams, that send it via USB, including the A68.